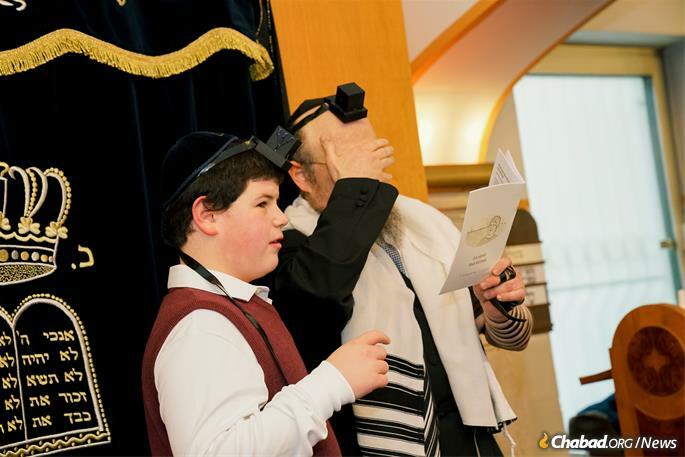 Zalman Diskin celebrates his bar mitzvah at the Munich, Germany, synagogue led by his father, Rabbi Yisroel Diskin, above. When the Diskin family was contemplating a move from the Crown Heights neighborhood of Brooklyn, N.Y., to Munich in the late 1980s, there was no Chabad presence in Germany, the Berlin Wall was still standing, and they were instructed by the Rebbe’s secretary to get their parents’ permission before considering the move. 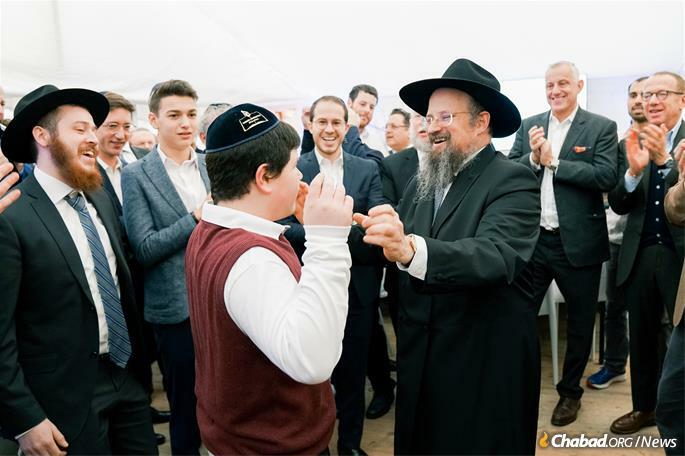 Thirty years later, Rabbi Yisroel and Chana Diskin speak fluent German, provide for the many needs of the diverse Jewish community of Munich and oversee 19 Chabad centers around the country. The Diskins have also been open with the community about the personal and practical challenges they have encountered during the last 13 years with their youngest son, Zalman, a young man with autism and hearing impairments. When Zalman was 5 months old, he contracted meningitis, and the Diskins began an unchartered, challenging journey—one that involved a great deal of learning and soul-searching. They noticed a hearing loss at 16 months; he had a cochlear implant after that. At 3 years of age, Zalman began to display symptoms of autism. “We were very determined to do whatever we could to help him recover,” says Chana Diskin. Do Autistic Children Have Special Souls? She and her husband were also torn about whether or not to hold a bar mitzvah ceremony for Zalman. She was struggling with practical and theological issues. “Would it be appropriate to spend so much money on a boy some would think ‘doesn’t get it?’ And it bothered her that it was questionable whether or not Zalman could count in a minyan. 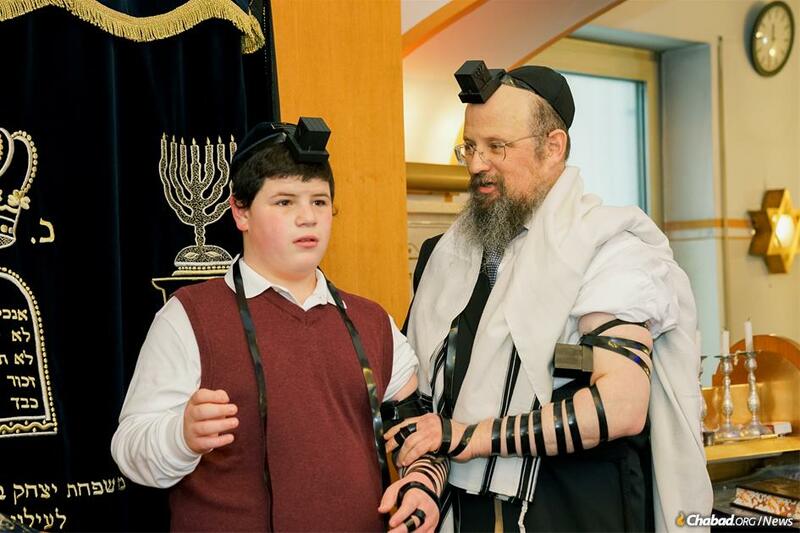 The Diskins began to plan the bar mitzvah, hoping that Zalman would be able to learn to wrap tefillin, even though they weren’t sure he would show up at his own bar mitzvah. As the bar mitzvah video captures, Zalman can exhibit unpredictable and difficult behavior. For example, he started the school year with a period of refusing to get on the bus and with hitting others. When he was younger, he flushed a very expensive cochlear processor down the toilet. Father and son say the Shema Yisrael prayer. Lynn was up for the challenge. Would Zalman rise to the occasion? Lynn asked Rabbi Diskin to create a video on how to wrap tefillin, which she used as a basis for a step-by-step book for Zalman. She illustrated two boxes—one representing the head and one representing the arm. Zalman learned that each has a home—in the tefillin bag—and does not belong on the floor. She started on the shel rosh (head) since it was less sensory. Then, she slowly moved to his arm. They practiced with a plastic tefillin prototype since Zalman was likely to throw it. “On the day of the filming, Lynn told my husband that Zalman was ready! I didn’t expect it,” said Chana Diskin. On Sunday morning, Jan. 21, 2018, members of the Munich Jewish community began to arrive at the bar mitzvah. Pairs of tefillin were on hand for those who wanted to wrap in Zalman’s honor. Transliterated siddurim were available so all would feel comfortable. As the time for the recital of the Shema neared, Zalman was escorted into the service, wearing his tefillin. “He kept them on until va’ed [the final word of the second line after Shema]!” says his very proud mother. Everyone was visibly moved. Then, he got frustrated and left.” The community continued to celebrate with delicious food and music under a tent pitched for the special occasion. Celebrating the event with the Munich Jewish community. Zalman’s bar mitzvah is inspiring and moving. It also beautifully illustrated the many ways to mark becoming bar mitzvah. When most of the Diskin boys became bar mitzvah, they celebrated by delivering a deep discourse from the Rebbe and by reading from the Torah. “My husband is a baal koreh [Torah reader] and wanted his sons to learn to read from the Torah,” reports Chana Diskin. Some sons also led the shacharit (morning) prayer service. The video of Zalman’s bar mitzvah has been hailed as an extraordinarily moving and poignant demonstration that each child and each bar mitzvah is unique. The Diskins and Zalman have come to serve as an important model for families of children with disabilities on their own special journey.